Joy for Colin Lynch as he wins his first Paralympic medal. COLIN LYNCH HAS secured Ireland’s fourth medal of the Paralympic Games, storming to silver in this morning’s C2 Time Trial. The 45-year-old made up for his disappointment in the Velodrome with an impressive ride in sweltering heat in Rio, finishing only behind Canadian Tristen Chernove. Lynch, who finished fifth in London four years ago, powered around two laps of the 10km course to clock a time of 28:02.25, 19 seconds behind the gold medal winner but a healthy 15 ahead of bronze. He never looked like finishing outside of the podium positions with a controlled performance to follow Jason Smyth, Michael McKillop and Eoghan Clifford onto the medal table. It will go someway to compensating the heartbreak of London when he missed out on a track medal by a tenth of a second. Lynch, who lives in Manchester but has Irish roots in Drogheda, adds Paralympic silver to the two golds he won on the UCI World Cup circuit last year. “It’s something that I have worked at for four years,” he said. “It’s an absolute dream to finally achieve the one thing that I didn’t have in the closet and that was a Paralympic medal. “After London I had to do a lot of soul searching. I had to ask myself if I was capable of performing at the highest level still. Meanwhile, Declan Slevin and Ciara Staunton both finished 11th in the H3 and H2 Time Trials respectively. 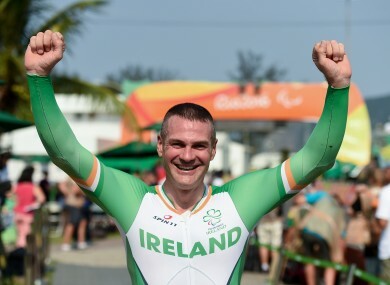 Email “Ireland's Colin Lynch storms to Paralympic silver with stunning Time Trial performance ”. Feedback on “Ireland's Colin Lynch storms to Paralympic silver with stunning Time Trial performance ”.